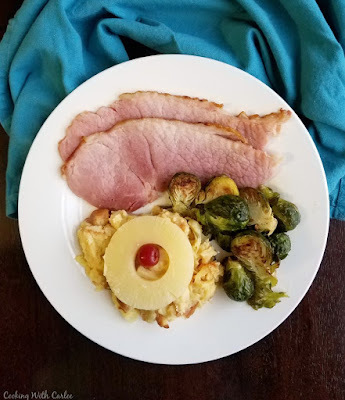 Scalloped pineapple is a perfect slightly sweet side dish to go along with a salty ham dinner. It will feel right at home on your holiday plate! Have you ever heard about a dish and been so intrigued that you couldn't stop thinking about it, even months later? That's what happened to me when we were discussing Thanksgiving menus in my Facebook group. 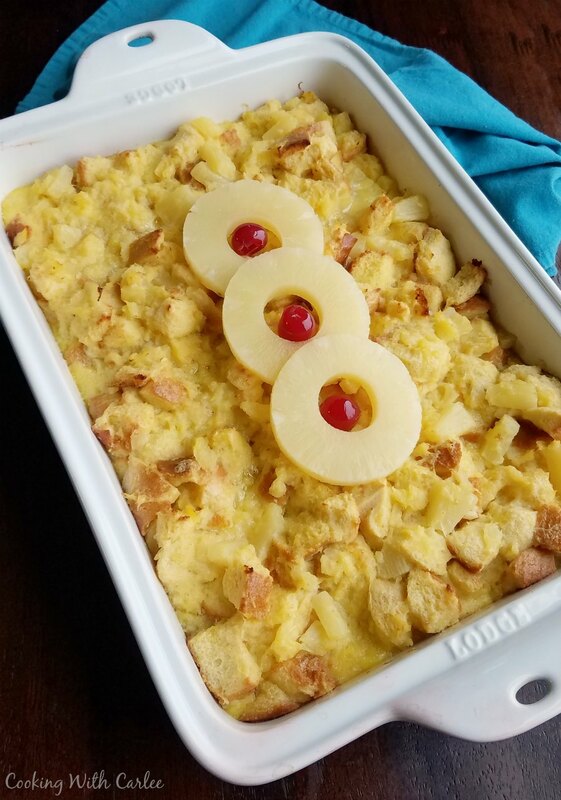 Multiple people brought up variations of pineapple casseroles. That isn't a thing in my family, but I love pineapple so of course I was interested. I didn't have a chance to make it for Thanksgiving, but that doesn't mean I didn't want to. So I kept pining over the idea. As Easter and the giant ham dinner were approaching, something in the back of my head kept saying "here's your chance!" Of course that voice was right. Salty ham and a sweet tangy pineapple dish would be perfect together. It turns out there are a few ways to do scalloped pineapple. So after checking out some recipes online, I asked our friend Julie for her recipe. She was nice enough to dig it up and send it over to me. I had every intention of making her recipe because it's tried and true, but you know sometimes I just can't help myself. I wanted more pineapple, plus with the extra fruit I thought I could get away with less sugar. Everyone was a bit surprised when I showed up at grandma's with my pineapple dish. Nobody had ever seen such a thing, but we don't often meet food we won't try so people dug in. It was a hit! Everyone enjoyed trying something new and the pineapple was a nice foil to both the ham and smoked brisket. Of course I loved it too. I've been on such a pineapple kick lately with the taste of the tropics pie, tropical baked oatmeal and even a pineapple rightside up oatmeal. So there was little surprise it was a hit with me! Have you ever had a recipe pester you for months on end until you finally made it? What are your favorite holidays side dishes? Drain the cans of pineapple. 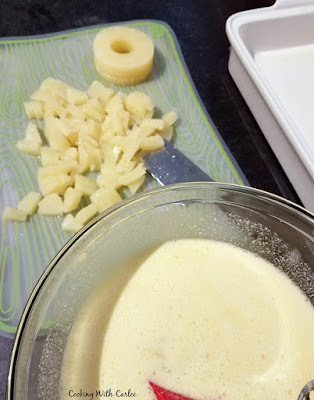 Remove three pineapple rings and set aside for garnish. Roughly chop the remaining rings. Add the eggs, one at a time and mix well between each. Stir in the salt, lemon juice, pineapple (except for the reserved rings) and bread. Pour into prepared pan and bake for about 50 minutes to an hour or until golden. Garnish with reserved pineapple rings and cherries if desired. Pineapple heaven! You know I love pineapple and this is such a great way to make it a side and so pretty too! Happy happy Friday friend! We are definitely sister pineapple lovers! Thanks, Andrea! I think it must be a regional thing. I had heard of it, but it's not a tradition in my family so I had to make some to try it! I've never seen this done with bread before...I'm curious to see if I will like it better than the Ritz cracker version! Thanks for sharing on Friday Frenzy! I am curious about the cracker version. Does yours have cheese on it? I've never heard of it or eaten it before! I am intrigued. We're eaters so I kinda think we'd dig this recipe! How interesting! I have to see if my aunt has ever heard of this! It intrigues me, but I will probably cut the recipe in half the first time just to see how it goes over! That's probably not a bad idea! My husband did like it more than he thought he would (he's not usually into sweet sides), but we'd have trouble eating a whole batch by ourselves! 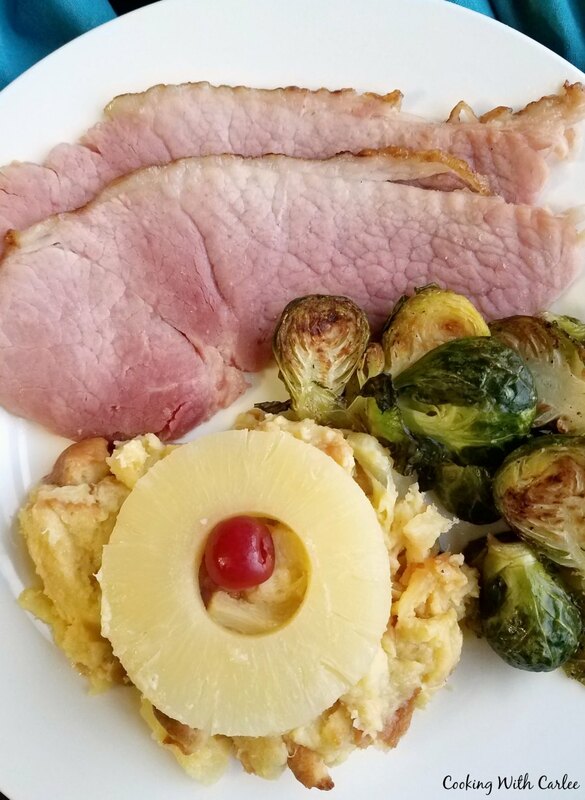 Hi Carlee, salty ham and sweet pineapple are a match made in heaven. I have never heard of anything like this recipe before either, but it sounds a perfect side for ham. Making a sourdough starter was a recipe that pestered me (if that counts), when I finally made it, it felt like an itch that was finally scratched! I am so glad you got your starter going! This recipe was one of those that I couldn't quite wrap my head around what it would be like, so I had to make it. Luckily my family was happy to try it as well! I do like pineapple and this recipe sounds very intriguing. I'm going to have to try it. Thank you for trying it out and then sharing it. I couldn't help but to give it a go, I was too curious to not make it! <3 My family was curious too, so it was fun to try it with everyone! It looks delicious! What kind of bread do you use?